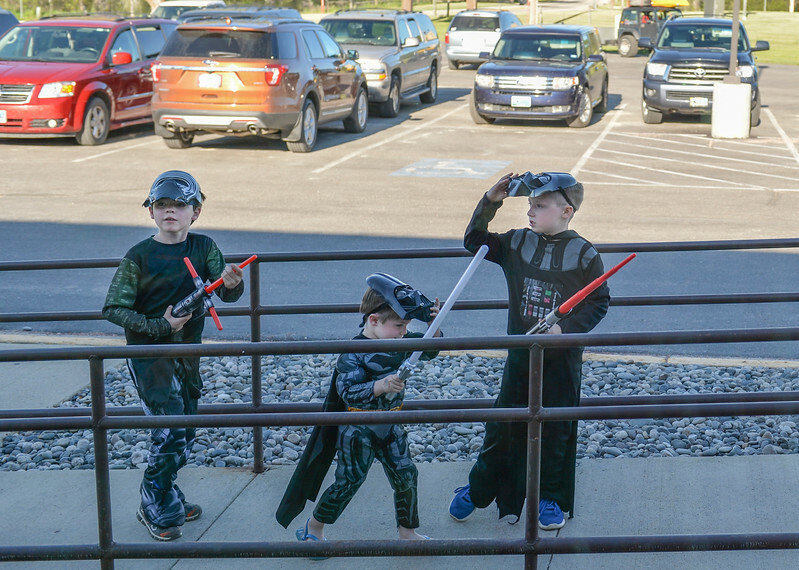 Seven-year-old Piersen Resser, left, Bennett Resser, 3, and Evan Yager, 7, walk to the entrance of the building during the Mother and Son Star Wars Date Night Friday at the Tongue River Community Center. The Star Wars themed event was to provide a fun opportunity for moms and their sons for Mother’s Day Weekend. 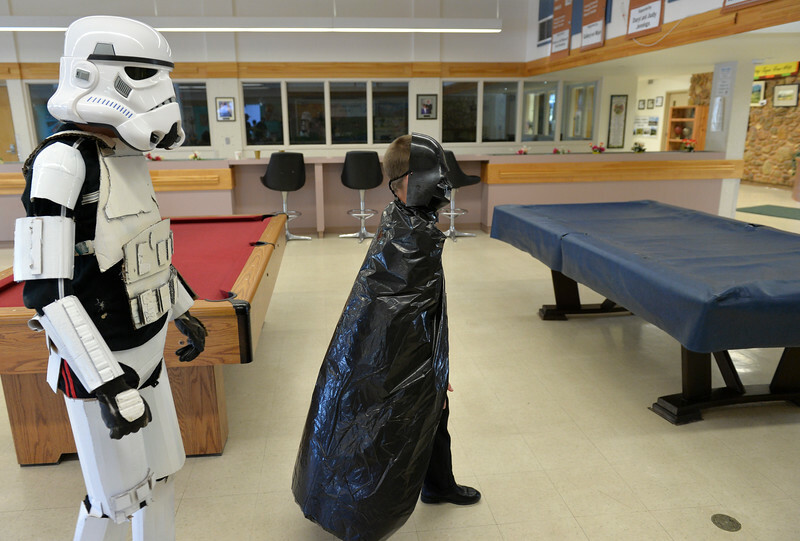 Jason Barron wears his homemade stormtrooper costume as his brother Kolbe Barron dressed as Darth Vader using a garbage bag during the Mother and Son Star Wars Date Night Friday at the Tongue River Community Center. The Star Wars themed event was to provide a fun opportunity for moms and their sons for Mother’s Day Weekend. 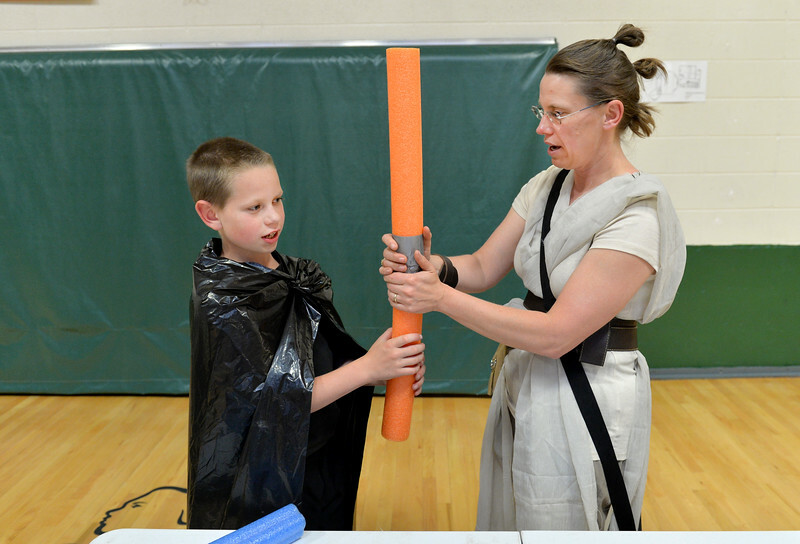 Monique Barron, right, helps her son Kolbe Barron make a noodle light saber during the Mother and Son Star Wars Date Night Friday at the Tongue River Community Center. The Star Wars themed event was to provide a fun opportunity for moms and their sons for Mother’s Day Weekend. 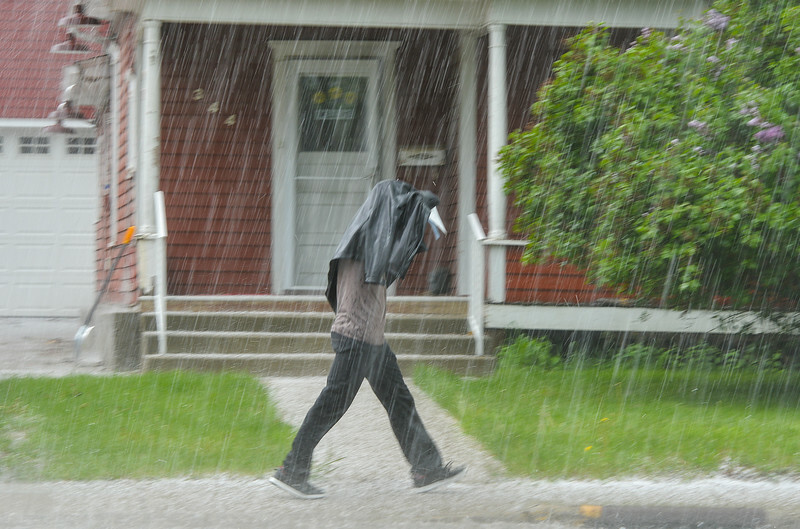 A pedestrian is caught under pea-sized hail Wednesday afternoon on Coffeen Avenue. The National Weather Service has issued a flood advisory for small stream areas in Sheridan County. 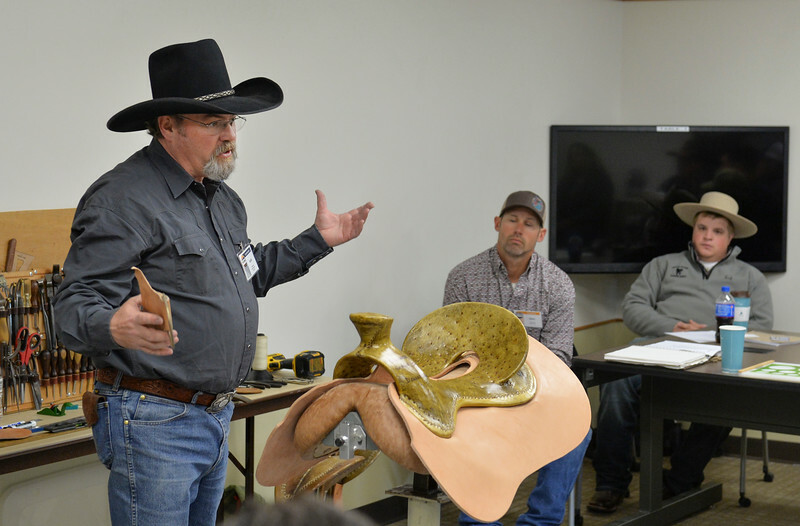 Seither Seidel of Cody, Wyoming, talks about ground seat fundamentals for saddle making during a workshop for the Rocky Mountain Leather Crafters convention Thursday at Sheridan College. 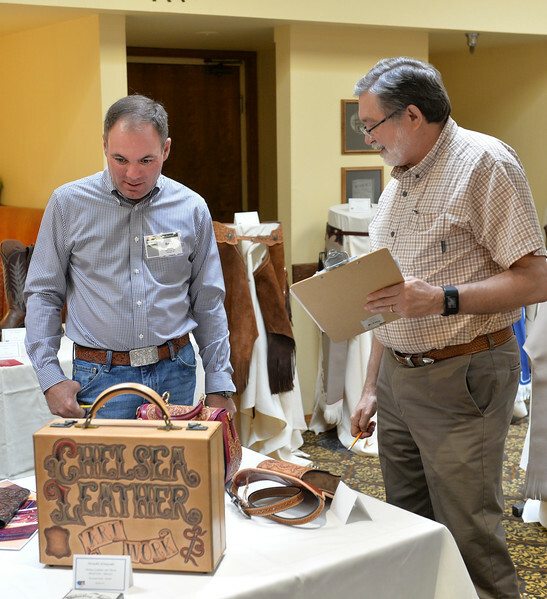 The week-long annual convention draws tradesmen and women from across the globe to Sheridan Wyoming to learn techniques and skills in leather crafting, shaping and tooling. 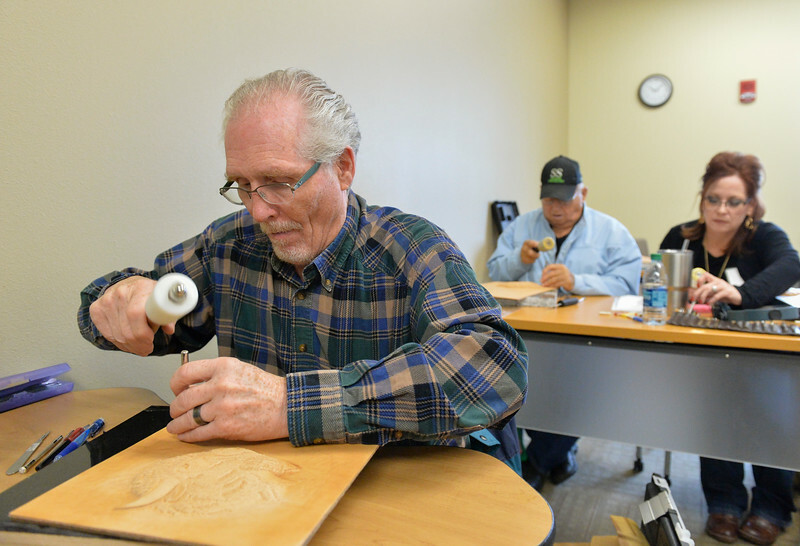 Workshop participant Dennis Bloxham of Livingston, Montana, hammers away for an extreme embossing workshop during the Rocky Mountain Leather Crafters convention Thursday at Sheridan College. The week-long annual convention draws tradesmen and women from across the globe to Sheridan Wyoming to learn techniques and skills in leather crafting, shaping and tooling. A workshop participant hammers a leather tool in an extreme embossing workshop during the Rocky Mountain Leather Crafters convention Thursday at Sheridan College. The week-long annual convention draws tradesmen and women from across the globe to Sheridan Wyoming to learn techniques and skills in leather crafting, shaping and tooling. 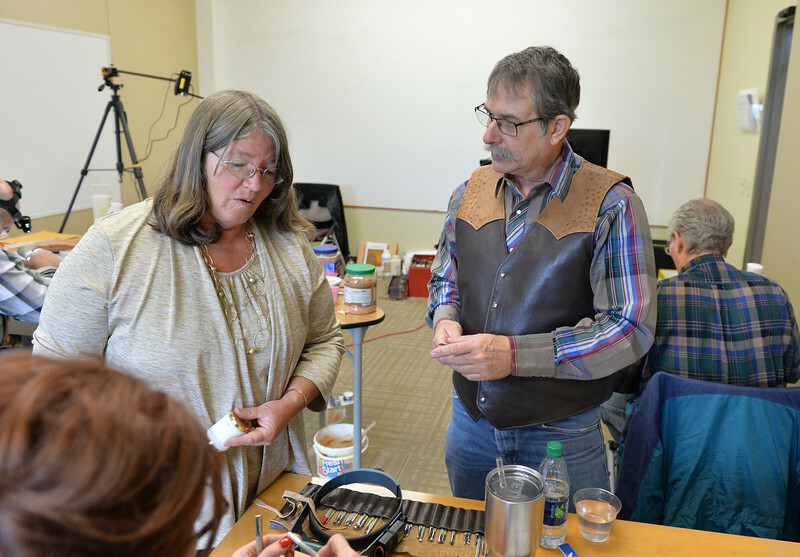 Extreme embossing workshop instructors Kathy Flanagan, left, and Clay Banyai talk with a participant during the Rocky Mountain Leather Crafters convention Thursday at Sheridan College. The week-long annual convention draws tradesmen and women from across the globe to Sheridan Wyoming to learn techniques and skills in leather crafting, shaping and tooling. 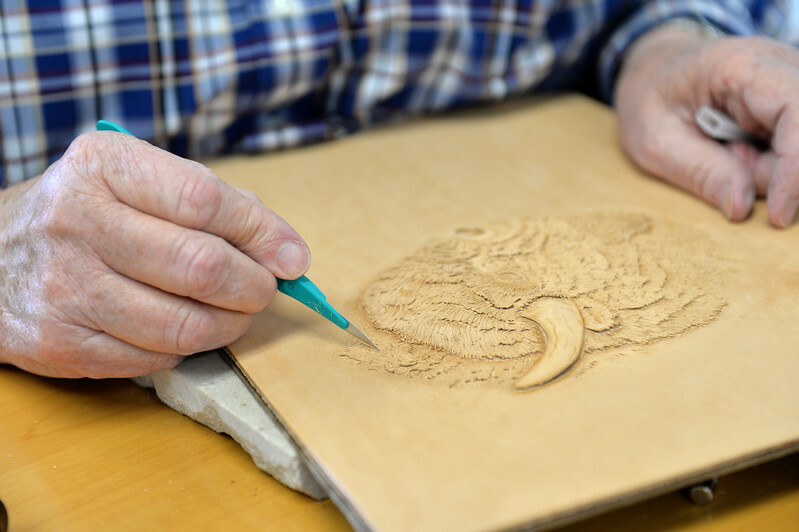 An extreme embossing workshop participant adds fine detail to his work during the Rocky Mountain Leather Crafters convention Thursday at Sheridan College. The week-long annual convention draws tradesmen and women from across the globe to Sheridan Wyoming to learn techniques and skills in leather crafting, shaping and tooling. 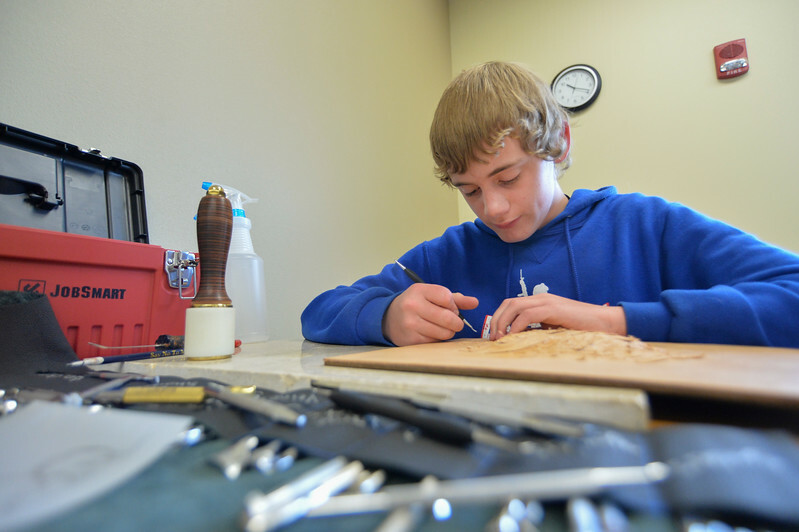 Sixth-grader Justin Tope of Rozet, Wyoming, works on his extreme emboss project in a workshop during the Rocky Mountain Leather Crafters convention Thursday at Sheridan College. 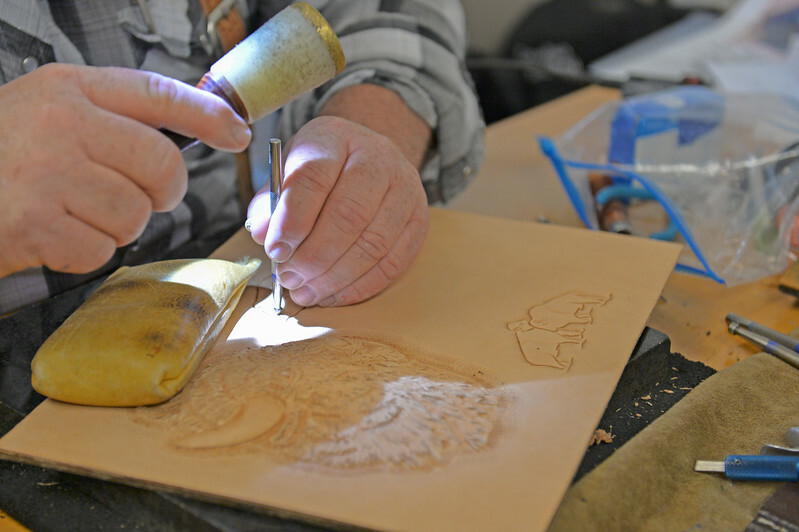 The week-long annual convention draws tradesmen and women from across the globe to Sheridan Wyoming to learn techniques and skills in leather crafting, shaping and tooling. 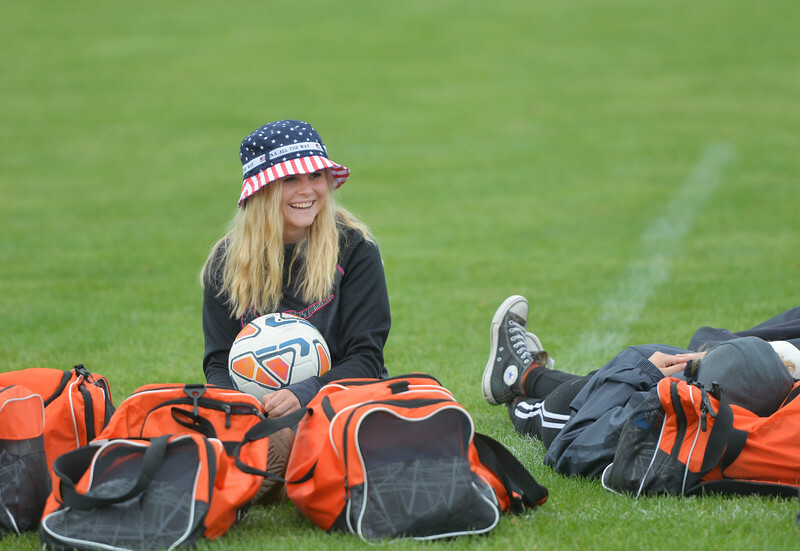 Worland boys soccer manager Mackenzie McGonigal, a freshman, chats with a friend as the team warms up during the first round of the State Soccer Championships Thursday at Big Horn High School. Food Bank volunteer Sandy Nicholson moves donations collected by the US Post Office to the end of the truck Friday at the People Assistance Food Bank. 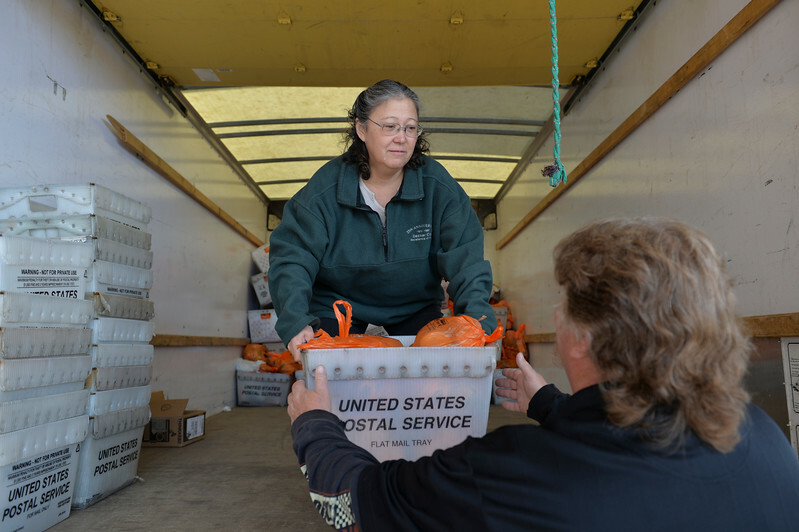 The US Post Office in Sheridan collected more than 10,000 pounds of food from their 25th annual food drive, which was collected by mail carriers from the community earlier this week. The donations from the community was split between the Salvation Army in Sheridan and People Assistance Food Bank. Food Bank volunteer Mike Voogd carries donations collected by the US Post Office to the end of the truck Friday at the People Assistance Food Bank. 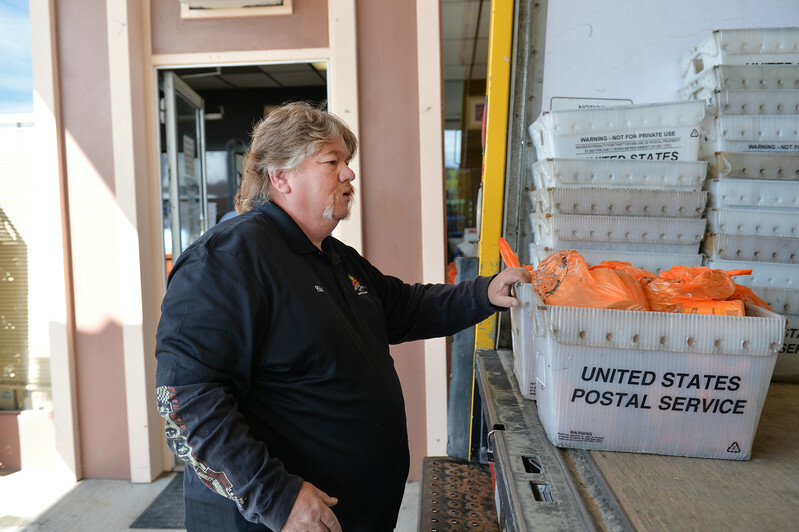 The US Post Office in Sheridan collected more than 10,000 pounds of food from their 25th annual food drive, which was collected by mail carriers from the community earlier this week. The donations from the community was split between the Salvation Army in Sheridan and People Assistance Food Bank. 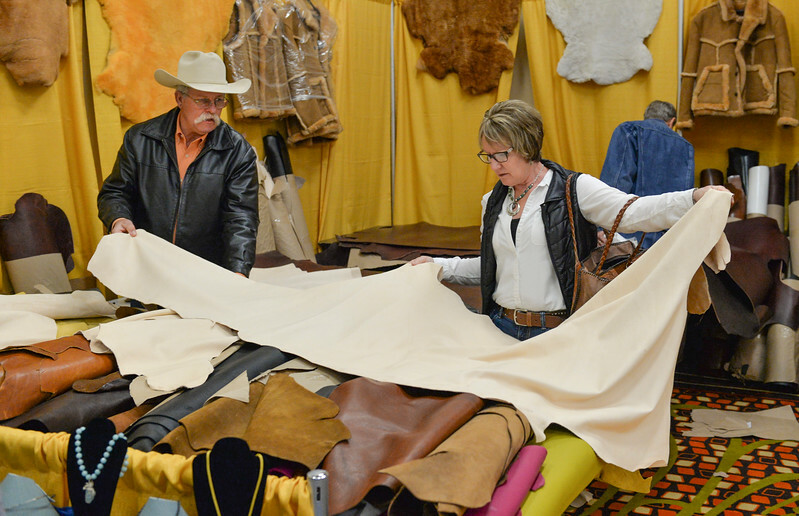 Kyle and Cindy Butts of Gillette, Wyoming, look at sheep skin during the annual Rocky Mountain Leather Crafters Trade Show Friday at the Sheridan Inn Convention Center. 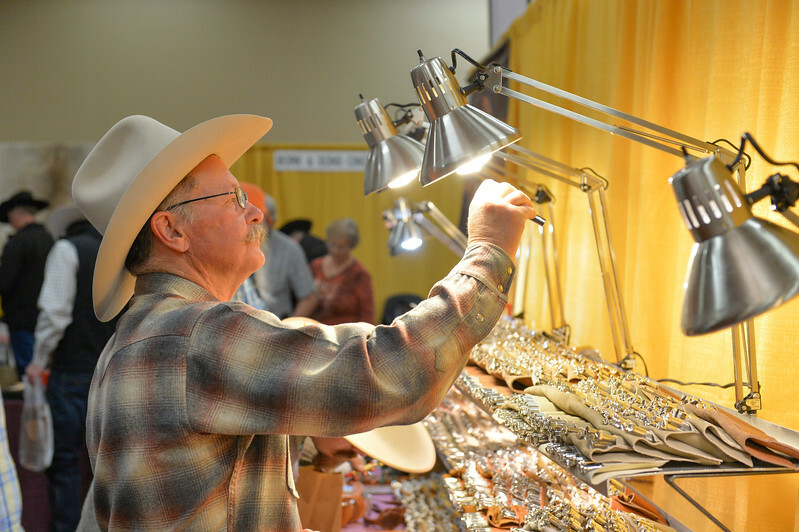 Dan cushman of Lusk, Wyoming, looks at leather tools during the annual Rocky Mountain Leather Crafters Trade Show Friday at the Sheridan Inn Convention Center. Show judges Barry King of Sheridan, left, and Jim Linnell of Venus, Texas, look over entries of the competition during the annual Rocky Mountain Leather Crafters Trade Show Friday at the Sheridan Inn Convention Center. 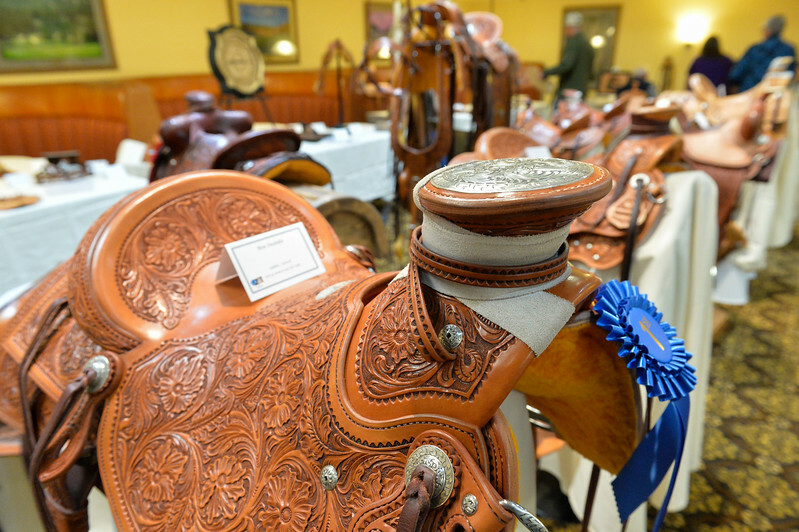 Leather tooled saddles are seen in the show competition during the annual Rocky Mountain Leather Crafters Trade Show Friday at the Sheridan Inn Convention Center. 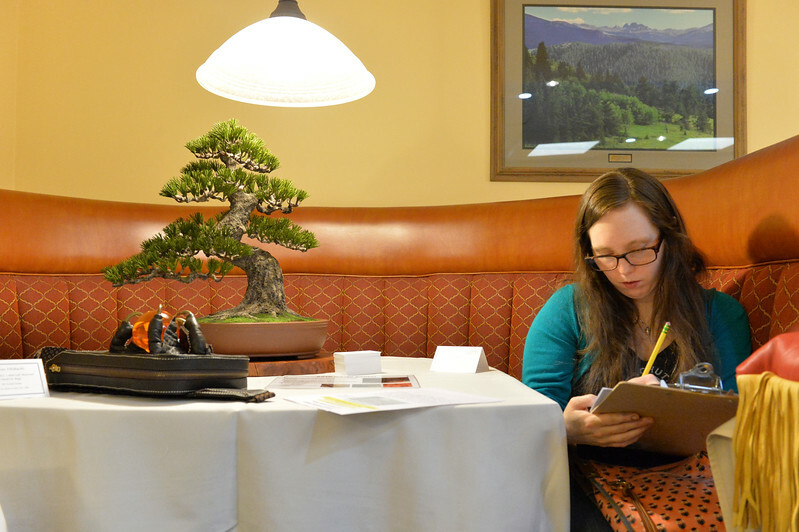 Show judge Annie Libertini writes notes next to a leather Goyo Matsu (pine white) Bonsai tree made by japanese crafter Takeshi Yonezawa during the annual Rocky Mountain Leather Crafters Trade Show Friday at the Sheridan Inn Convention Center. 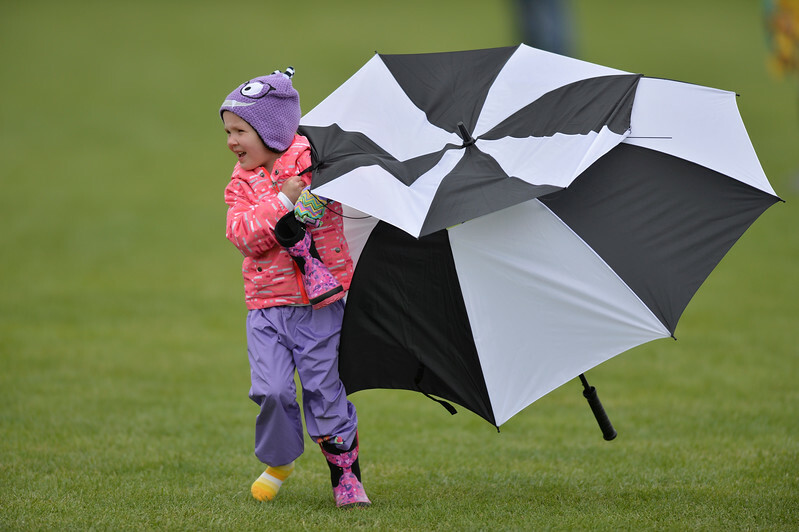 Two-year-old McKenna Matson retrieves her umbrella as her father coaches the Campbell County Lady Camels team during the girls class 4a State Championship semifinals game against Cheyenne Central Friday at the Big Horn Equestrian Center. 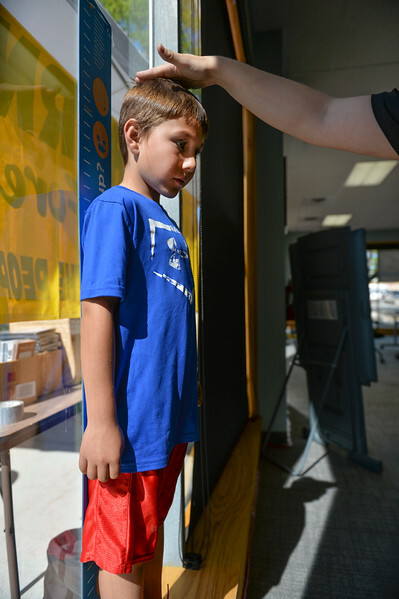 Seven-year-old Hesstan Ferber is measured by car seat techs during the Safe Kids Day Saturday at Sheridan Memorial Hospital’s downtown location on Gould. Different car seats, booster seats are required based on a child’s height and weight. See http://www.safekids.org/ultimate-car-seat-guide on the web for more info. The event was designed to educate families to make their children safer with their everyday activities. 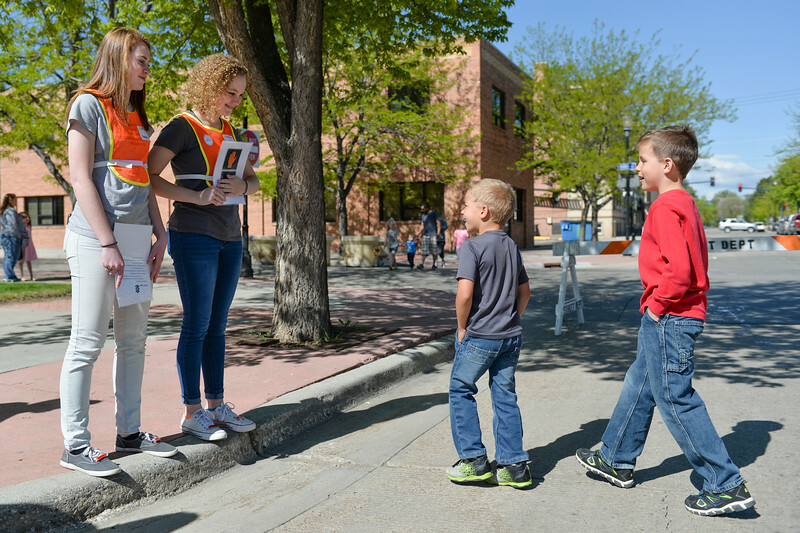 High school volunteers, left, Kaleigh Padgett and Isabelle Cruz signal Micah Pettyjohn, 8, and Jude Pettyjohn, 6, for a pedestrian safety exercise during the Safe Kids Day Saturday at Sheridan Memorial Hospital’s downtown location on Gould. Different car seats, booster seats are required based on a child’s height and weight. The event was designed to educate families to make their children safer with their everyday activities. 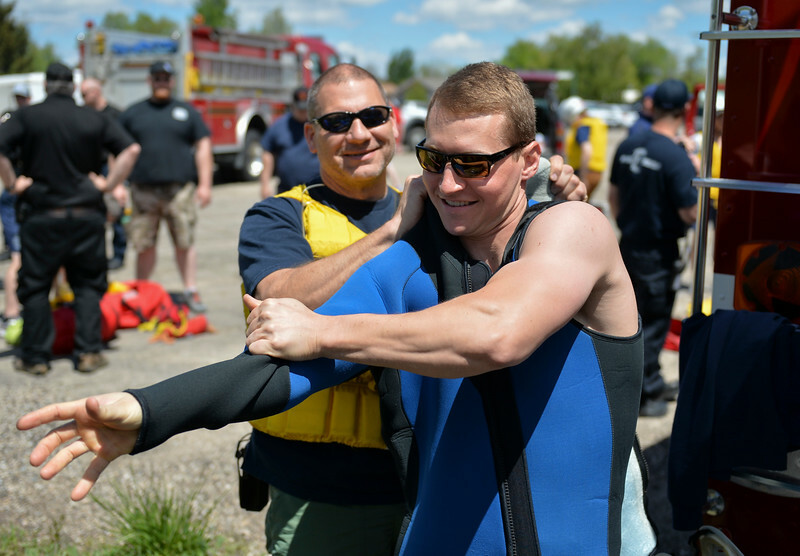 Sheridan Fire-Rescue Captain Greg Luhman helps Goose Valley volunteer firefighter Spencer Reid into a wetsuit during a swift water rescue training exercise Saturday on the Goose Creek by Thorne-Rider Park. The exercise was to teach basic skills in defensive swimming and floating in a river to avoid being pulled under the current. Personnel also practiced how to throw ropes from the embankment to persons in the water. 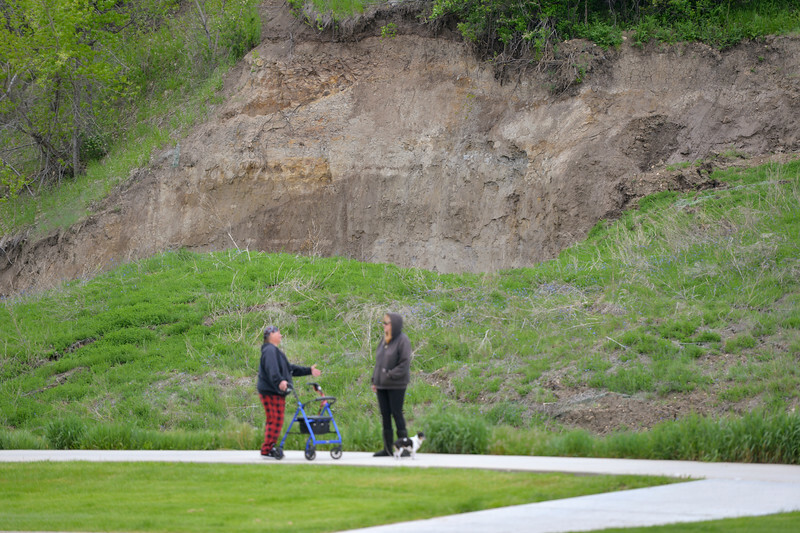 Participating agencies included Sheridan Fire-Rescue, Goose Valley Fire Department, Story Fire Department and Rocky Mountain Ambulance. 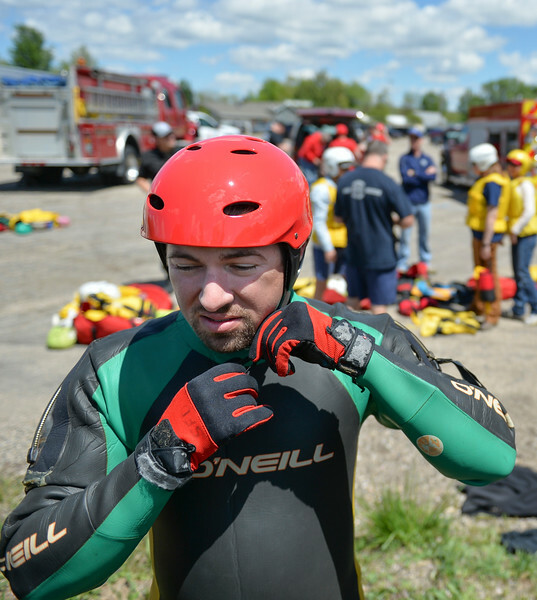 Goose Valley volunteer firefighter Ben Weaver puts on a helmet and wetsuit during a swift water rescue training exercise Saturday on the Goose Creek by Thorne-Rider Park. The exercise was to teach basic skills in defensive swimming and floating in a river to avoid being pulled under the current. Personnel also practiced how to throw ropes from the embankment to persons in the water. Participating agencies included Sheridan Fire-Rescue, Goose Valley Fire Department, Story Fire Department and Rocky Mountain Ambulance. 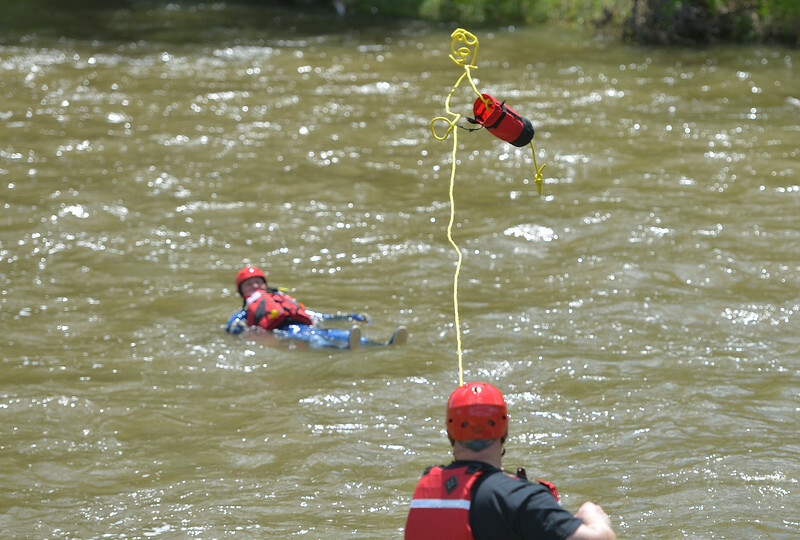 A first responder throws a rope to a Goose Valley volunteer firefighter during a swift water rescue training exercise Saturday on the Goose Creek by Thorne-Rider Park. The exercise was to teach basic skills in defensive swimming and floating in a river to avoid being pulled under the current. Personnel also practiced how to throw ropes from the embankment to persons in the water. Participating agencies included Sheridan Fire-Rescue, Goose Valley Fire Department, Story Fire Department and Rocky Mountain Ambulance. 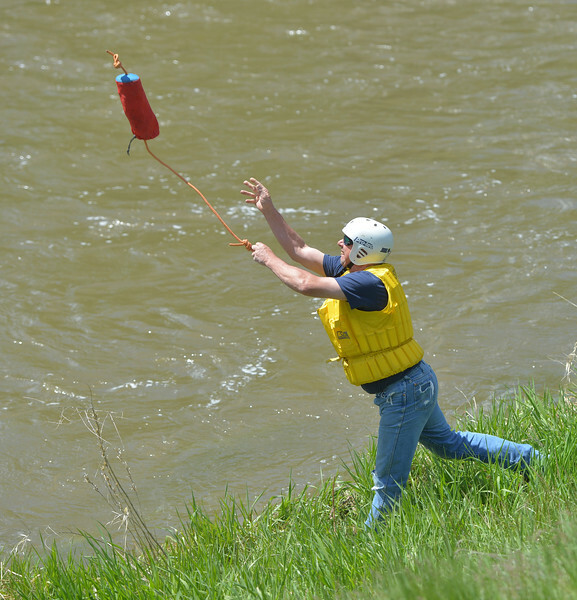 Goose Valley volunteer firefighter Pete Korsch tosses a rope to a person in the water during a swift water rescue training exercise Saturday on the Goose Creek by Thorne-Rider Park. The exercise was to teach basic skills in defensive swimming and floating in a river to avoid being pulled under the current. Personnel also practiced how to throw ropes from the embankment to persons in the water. Participating agencies included Sheridan Fire-Rescue, Goose Valley Fire Department, Story Fire Department and Rocky Mountain Ambulance. 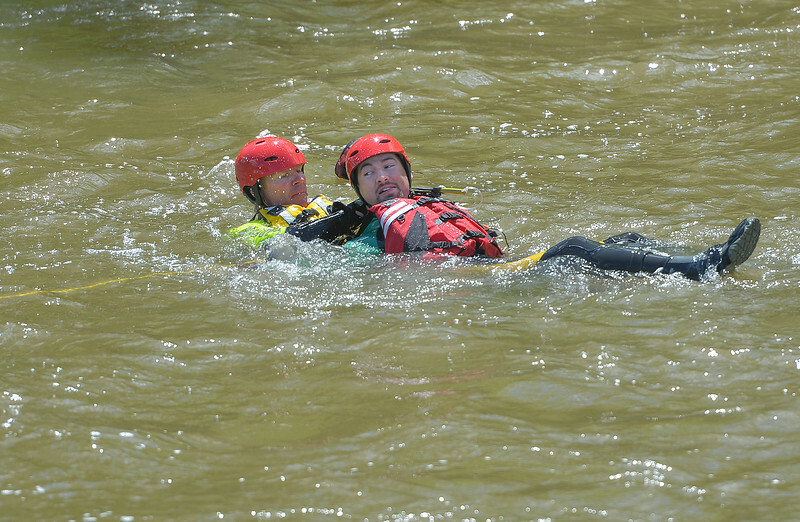 Goose Valley volunteer firefighters Justin Johnston, left, rescues Ben Weaver from the water during a swift water rescue training exercise Saturday on the Goose Creek by Thorne-Rider Park. The firefighters keep their feet up to avoid getting caught on the bottom of the creek and pulled under water. The exercise was to teach basic skills in defensive swimming and floating in a river to avoid being pulled under the current. Personnel also practiced how to throw ropes from the embankment to persons in the water. Participating agencies included Sheridan Fire-Rescue, Goose Valley Fire Department, Story Fire Department and Rocky Mountain Ambulance. 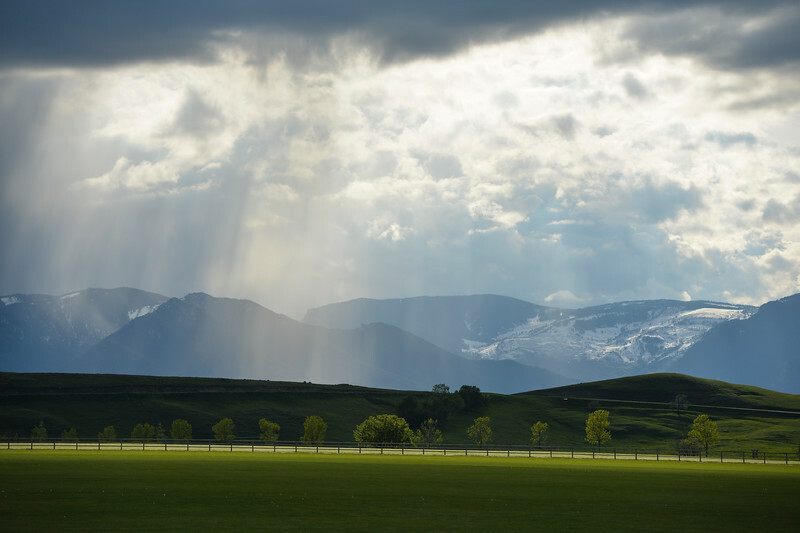 Rays of sunlight break through the clouds over the Bighorn Mountains Saturday at the Big Horn Equestrian Center.